As of March 2015, Tripura had around 577 km of national highways and 532 km of state highways. The state is well connected with its neighboring states with national highways. In 2015, PWD approved plans to construct two new national highways in the sate with lengths of 157.7 km and 22.9 km. The lifeline of Tripura is National Highway (NH-44) that connects Agartala with Guwahati in Assam. Passenger bus service between Agartala and Dhaka in Bangladesh is also available. 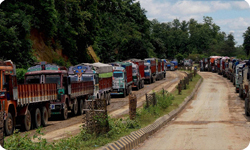 The Tripura Road Transport Corporation (TRTC) provides state road transport services. TRTC operates 39 buses and 20 trucks covering 112 routes. The road density in the state was measured at 3,026.23 per square km as of November 2015 whereas road density per thousand population stood at 9.3 in the state. Under the Pradhan Mantri Gram Sadak Yojana (PMGSY) sheme, launched in 2000 for connecting eligible rural habitats, 23,869.947 km of roads were constructed as until 2015. The total length of railways in the state is 153 km. 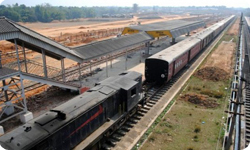 Agartala, Dharmanagar and Kumarghat are the main railway stations in Tripura. In 2015 NITI Aayog announced plans to commission a 15-km metre-gauge railway line between Agartala, the capital of Tripura, and Akhaura in Bangladesh. The project is expected to be completed by 2017. Tripura has one domestic airport at its capital Agartala which is administered by the Airports Authority of India. The airport is well connected with the major cities such as Delhi, Kolkata, Chennai and Guwahati. The airport, which is the second busiest in the North-east India, is 12 km away from the city. A flight from Kolkata or Guwahati takes about 50 minutes to reach Agartala. 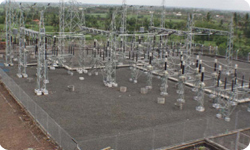 As of November 2015, Tripura had access to a total installed power generation capacity of 640.9 MW of which 185.51 MW was under state utilities; 5 MW was under the private sector and 450.39 MW was under central utilities. Fuel-wise of the total installed power capacity, 557.52 MW was from thermal power, 62.37 MW by hydropower and remaining by renewable power sources. As on November 2015, 837 of total villages 863 villages were electrified. 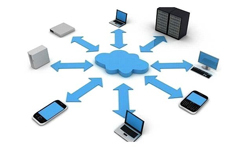 Tripura has the distinction of being first state in the Eastern and Northeastern region to complete State Wide Area Network (SWAN). Overall it became the sixth state to achieve this feat in India. BSNL, Reliance, Vodafone, Idea, Aircel and Airtel are the main teleom service providers in the state.